The era of the acoustic singer-songwriter, which began almost 50 years ago with brilliant work by the likes of Joni Mitchell, Leonard Cohen, Malvina Reynolds and Tom Waits, is over. To borrow a phrase from Addison County songwriter Richard Ruane, it ended with thousands of “well-meaning folks with guitars” trying desperately to write something new and different but ending up with lesser versions of the same old thing. The hot label for new acoustic music is Americana, which seems to mean anything that sounds like Gillian Welch or Tim O’Brien and also features banjos or mandolins. 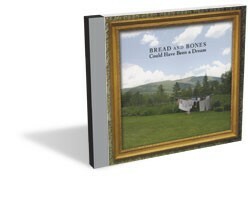 One of the Vermont groups making headway in this genre is Bread and Bones, a trio fronted by the aforementioned Ruane, and featuring vocalist Beth Duquette and bassist Mitch Barron. Their second album, Could Have Been a Dream, was released last month. The recording is loaded with quality, well-played material. Although Ruane plays mandolin, banjo and ukelele on the album, his solid guitar work and singing voice are his strongest contributions to the Bread and Bones sound. Since he’s the group’s primary songwriter — all but three of the songs here are Ruane originals — it’s no surprise that he sounds right at home fronting the band. Like a few other fine Vermont songwriters — such as Mary McGinniss, Josh Brooks, Kristina Stykos and Alan Greenleaf — Ruane is a talented storyteller, painting whole scenes with his lyrics. “Will I Be Welcome” is a meditation on returning home to friends and family after a long time gone. “This Is the Day” is an invocation to new beginnings. One of my favorites is “Play a Waltz and Go Home,” a three-quarter-time twirl that truly feels like the last waltz at the end of a wonderful night of dancing. The song also features the exquisitely gentle touch of Pete Sutherland’s fiddle. Duquette has a lovely voice, and whenever she sings lead — “Could Have Been a Dream,” “Love Is a Reason,” “In the Air,” “Who Do You Think It Was” — her soulfulness shines through. On the rest of the tracks her harmonies provide a lovely contrast to Ruane’s plaintive tenor. Last but definitely not least, Barron is, for my money, the top acoustic bass player in Vermont. He is always solid and tasteful, providing the foundation at all times and adding boom and variety when needed. Could Have Been a Dream has minimal liner notes, so the music does most of the talking. These 14 tracks range from banjo waltzes (“Emily Sits by the Window”) to a quirky ukulele version of Bob Marley’s “Three Little Birds.” That variety and a solid sound are two of the reasons that Bread and Bones are attracting a growing fan base, from the Caffé Lena in Saratoga Springs, N.Y., to coffeehouses in Maine and throughout Vermont. You can hear Bread and Bones live twice this week in northwestern Vermont: Thursday, December 15, at 51 Main in Middlebury, and on Saturday, December 17, as part of the Silo Sessions music series at Bread & Butter Farm in Shelburne.